Spring-like temperatures and a lack of snow have made the 2016 Nordic season challenging, but the racing must go on! At the Bates Carnival on January 16, we finished seventh out of 17. Junior Sadie James (Avon, Maine) received Bobcat of the Week honors for her standout performances — qualifying for the heats in the sprint and finishing 22nd in the 4.5km skate race. Sophomore Parker McDonald (Wolcott, Colo.) led the men, finishing 22nd in the 9km skate. We finished seventh out of 16 at the Colby Carnival on January 24. The men’s and women’s teams both finished in sixth place on Saturday in the 15km classic. Senior captain Grace Wright (Rutland, Vt.) led the team with a personal best 12th place. Laurel Fiddler (Crowley Lake, Calif.), Sadie, and Halie Lange (Brattleboro, Vt.) were close behind in 19th and 22nd and 26th. Corky Harrer (Minneapolis, Minn.) led the men in 22nd, his best result so far this season. Parker and junior Max Millslagle (Bend, Ore.) were close behind in 25th and 31st. The sprint relay day was AWESOME. In an ironic twist, both Laurel and Corky went down in the mass start and went out of the stadium in last place. However … after six combined laps and epic comebacks, both teams finished in the top 10! Helen Sudkamp-Walker (Fairbanks, Alaska) and Halie WON their heat and ended up scoring for the team — it was super exciting! The highlights from the UVM Carnival include four women in the top 20 in the 5km skate — putting them in 5th overall on the day — and junior Nate Moreau (Falmouth, Maine) having a PR in the 10km skate race, finishing in 24th. 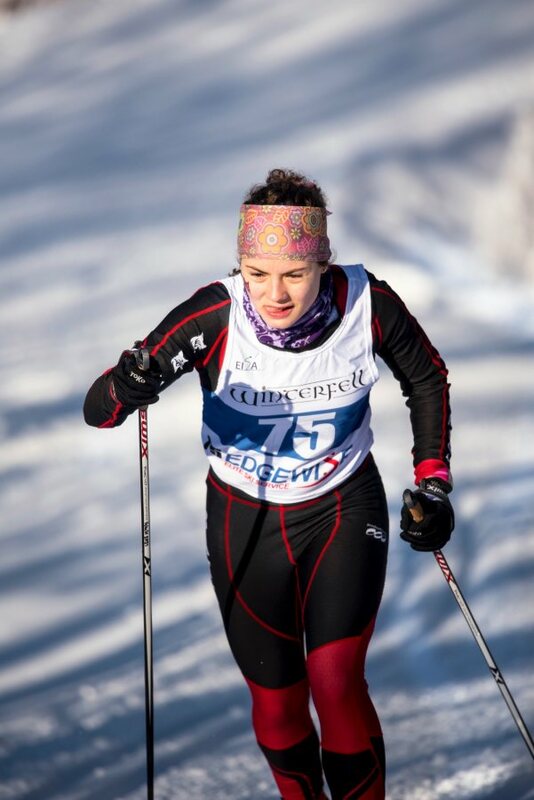 Despite the sub-zero conditions, we showed our strength in classical at the Dartmouth Carnival, with Sadie coming in a strong 13th, followed by Britta Clark (Ripton, Vt.) in 24th and Grace in 26th. Corky lead the men in 24th, followed by Max in 28th, and Nate in 35th. At the Williams Carnival in Lake Placid, N.Y., Max led the men’s with a combined two-day time of 40:11.7, good for 24th place out of 68 skiers and 46 carnival points. Nate came in right behind Max in 25th place with a combined two-day time of 40:34.3 and 44 carnival points. Corky rounded out the men’s Nordic skiers who contributed to the team’s point total with a two-day combined time of 40:45.8 and 36 carnival points. Britta had a combined time of 46:49.8 — good for 20th place out of 65 women in the carnival. Grace finished in 21st place with a combined two-day time of 46:50.6. Laurel rounded out the top three Bobcats, finishing with a combined two-day time of 46:57.9, good for 23rd place and 50 carnival points. It’s also worth noting that Sadie stood out in the 5K classic pursuit, finishing in 16:48.3, the fastest time by a Bates women’s Nordic skier and the 11th fastest time in the field. Her combined two-day time of 47:15.3 put her in 25th place overall and fourth on the team. The addition of Assistant Coach James Upham, who I am pleased we were able to keep again this year; he has been tremendous and a big part of our success. 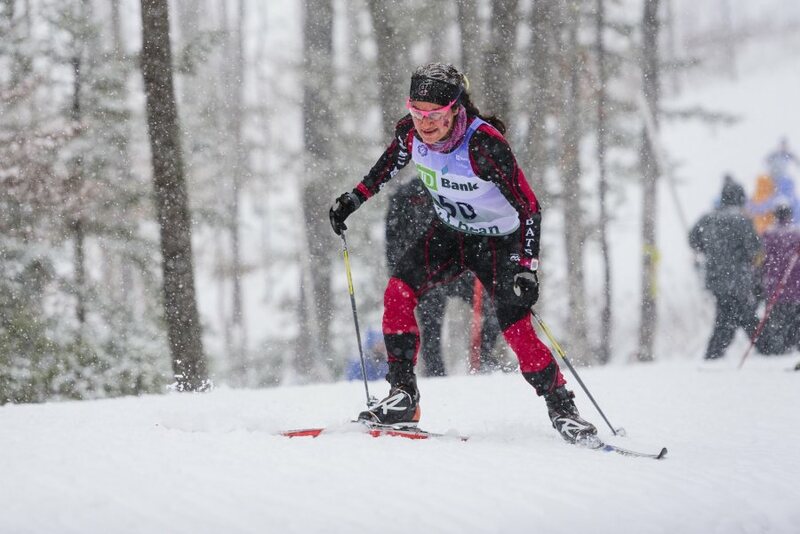 Hallie Grossman ’15 made history by being the first woman at Bates to compete in four NCAA Skiing Championships. She was also named Bates Female Athlete of the Year! The women’s team consistently competed in the top-four in EISA. Great training camps, with lodging so kindly offered to us from our wonderful alumni! We celebrated COACH FLYNN and the naming of the brand new Nordic and Alpine Ski Rooms. These facilities are simply amazing, and we so very fortunate to have them! Thank you to all who contributed to these capital improvements for the program! 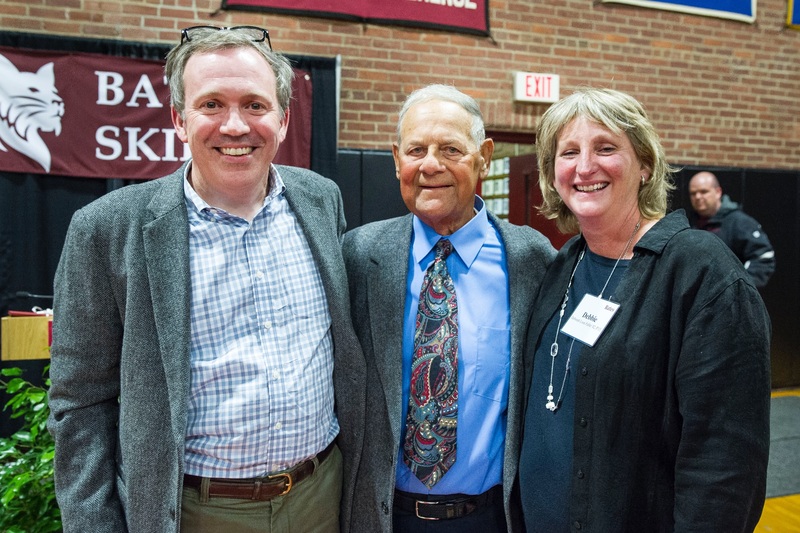 A huge crowd of Bates skiing faithful turned out in Alumni Gymnasium during Back to Bates Weekend to recognize legendary Bates skiing, baseball, and golf coach Bob Flynn P’85, P’89 with the naming of the newly renovated Alpine and Nordic ski rooms, made possible by generous gifts in honor of Coach Flynn. Surrounded by friends and family — including his wife, Benita, daughters Becky Flynn Woods ’89 (current Nordic ski coach); Elizabeth A. Flynn P’14, P’17, P’17; and Susan Flynn Dorris ’85 — Coach Flynn received a rousing chorus of “We love you coach, Oh yes we do!” after being lauded by Director of Athletics Kevin McHugh, President Clayton Spencer, and Bates Trustee Steve Fuller ’82, P’13. Pictured here (l–r) are Bates Trustee Steve Fuller ’82, P’13; Coach Flynn; and Debbie Fuller ’82, P’13. Please come watch the Bobcats in our late-season meets! You can find us on the race course and then at our trailer, surrounded by a wonderful group of parents who support the team with hot food and treats each weekend. JOIN US! Your financial support of Bates Nordic Skiing is vital to the success of the program. All contributions will go to retaining quality assistant coaching, team travel and equipment, and to help with recruiting. Overall, we are hoping to raise $25,000 to supplement the existing operating budget and allow Nordic Skiing to thrive and grow. Please help lead the way for the next generation of Bates skiers. All gifts, no matter the size, will help build a strong program for the future. 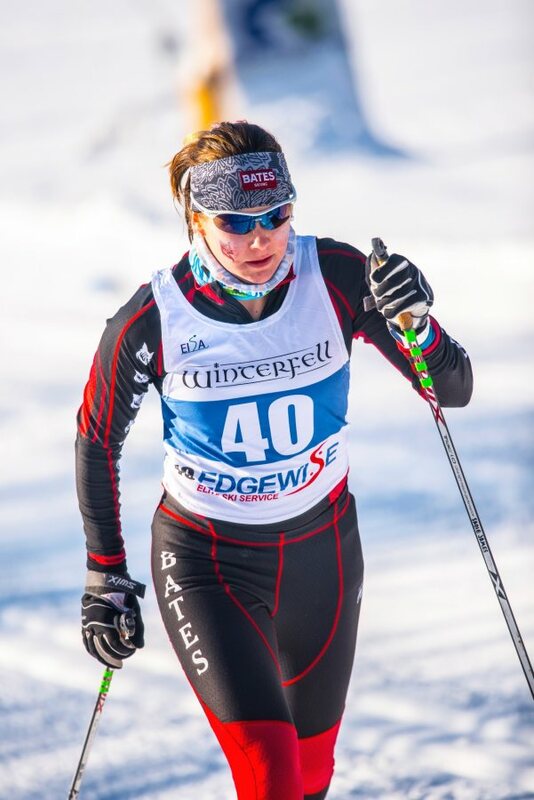 To support Bates Nordic Skiing just choose “Friends of Bates Athletics” on the online giving form and mention “Nordic Skiing” in the comments box to designate your gift to the team. On behalf of the team, thank you for all you do for Bates Nordic Skiing!